The Plan (and the Reality!!). Be sure to visit the Blog pages for the latest updates. Returned home on Tues 9 Jan after completing almost 700km - the last section of the South Island. Now updating blog posts and awaiting some fine weather to complete our total TA journey by tackling the last remaining stretch - that 48km of the Tararua Ranges!! Flying to Christchurch today, getting dropped of at the Bealey Hotel later this afternoon. A brief walk of a few kms should see us at the Bealey Hut for our first night of what will hopefully be the last phase of the TA walk! Walking times - in some of the latest blogs from the South Island I have tried to give an idea of walking times versus total time each day - this is because some people have expressed interest in how fast a couple "our age" (!!) do it versus the more common 20-30+ year old legs mostly doing it. When I mention "walking time" this also includes lots of micro-breaks for photos, changes of clothes, passing chats with other hikers, uphill rests for me (!) etc - I tended to only pause the Suunto recording for our 10-15 min smoko and half hour lunch breaks. Just FYI if planning :-) Always remembering that changing track and weather conditions, including river flows can affect times!! ​We completed Otaki Forks to Wgtn and on 7/11/16 started again from Taumarunui. We completed to Levin (leaving the Tararua section of 48km as the only bit of the North Island to finish off). A couple of weeks of doing stuff at home and on the farm was required before we could set off for the South Island, which we had decided we would start nobo from Bluff! We flew to Invercargill on 15/12 and walked Bluff to Invercargill 16/12. My knee was an issue so we hired a car and visited friends and places in the lower SI for two weeks before restarting at Invercargill. Unfortunately I had hurt my back during this "time off" and after several days of hiking up the SI it was clear that another (!!!) injury break was required. So after completing only 5+ days of walking the SI, we headed home on 3/1/17. Disappointing, but we are already planning when to get back on the trail one the back improves! We have decided to section hike the Otaki Forks to Wellington stretch over the spring - and started with the Pukeatua Track last Sunday 11th (see blog). Having done that section (in amongst farm work etc) we will head off back to Taumarunui (to recommence where we left off in April) early November. 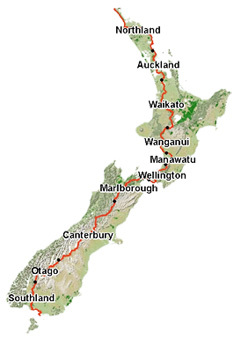 Our plan is to finish the North Island with the Taumarunui to Otaki Forks stretch and then, after a few days break to organise things at home, head off to walk the South Island. Its great to be started again!! As you may have seen from the blogs, we decided to start again at Marsden Point and head to Auckland to test out the knee. This was OK so we headed back to Opua and started from the Waikare Inlet heading to Whangarei. We had to come home for 10 days or so for family things on Sat 27 March, so stopped at Tidesong B&B (near Pataua) as we couldn't make it around the Whangarei Heads in the time available. We head back up to Whangarei on Thurs 10/3/16 to finish off two days hiking there - then its back to Opua and from there to Takahue to do the 4 days or so across to Kerikeri (Northland Forests), which we haven't done yet. That will complete the Cape Reinga to Auckland Central portion of TA. Then, all things being equal, we will bus back to Auckland Central and start heading south for as long as the weather and bodies allow. The revised plan is to do as much of the North Island as possible this season - then, if necessary, finish the North Island later in the year and move onto the South Island (maybe around November depending on weather etc). So, where the TA is concerned, we have learnt that "The Plan" must be flexible - such is life!! So......... Belinda has for some time had an urge to walk at least parts of the Te Araroa Trail. Early in 2015 she asked me (Tony - chief scribe) if it was something I would be interested in doing - especially as I had just resigned my latest job with the aim of having some months off to catch up on jobs around home and farm. To her (probable!!) surprise, I said "why not"!! So for some time now the research, planning and purchasing has been underway. I'm a minor tech nut, so this has been an excuse to purchase some nice new toys as well (more about that at some stage in the future)! The resources available from the Te Araroa Trust, as well as from other previous walkers' blogs, has been tremendous. A special thanks to Kirstine who wrote a fantastic blog of her 2014/15 trip that contains heaps of excellent information, written in true Kiwi style, that we found extremely helpful (and inspiring!). Our current plan is to kick off around mid-October 2015. Getting back from a few weeks overseas in early September gives us a few weeks to hopefully get lambing and calving out the way and get things set up for our 4+ (5?) month adventure. While not experienced trampers, we have a fair part of a lifetime hiking around the hill country farmland on the Kapiti Coast, New Zealand so maintain a "reasonable level of fitness. We've done the likes of the Tongariro Crossing a few times and Belinda recently walked, with her sister, the Milford and Routeburn Tracks and, previously, the Abel Tasman Track. We are trying to do regular hill track work to continue to build on the fitness a little - but don't think anything can ever really substitute for real "trail fitness" that will come with the start of the walk proper! Apart from the walk itself being a really exciting opportunity, it's also a chance for new learnings. As well as bits of new technology, this blog forms part of the learning as well, as I've never done one before. Hopefully the experience isn't too painful - for me or for the occasional person that might (maybe?) actually read it!! I'm almost loathe to include links as there are so many that may be of use to different people, and any list can never be "right" - I know there will be many resources that I have not even come across in my research. However, for what it is worth, here is a selection of some of the ones that we have found useful.